The Competitive Advantage You Need To Succeed! 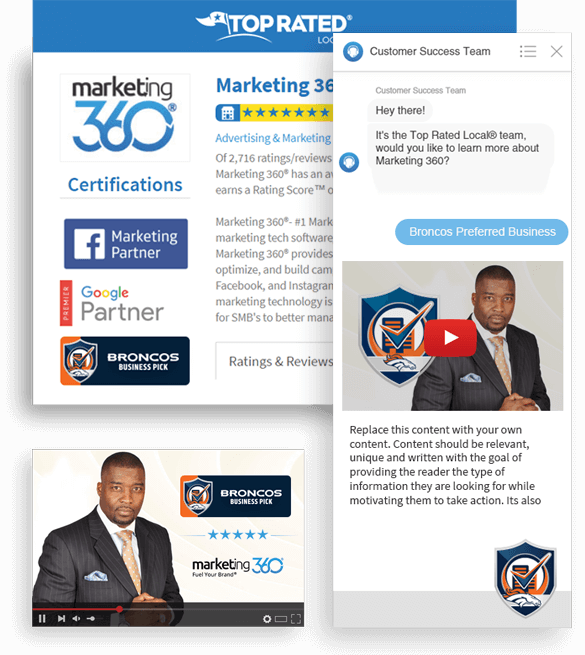 The Broncos Business Pick sets you apart from your competition, increasing your marketing effectiveness by 50%. from one platform & one team. Gain a Competitive Advantage to Boost Your Company Above Your Competition. One thing that is unique about the Top Rated Local® platform is it’s a combination of both talent & technology. This means, you not only get the best tools you need to market and grow your business online, but you also get a dedicated reputation team who does everything for you. This allows you to focus on running your business while we focus on driving you business. The Broncos Business Pick is a powerhouse strategy for local business owners. 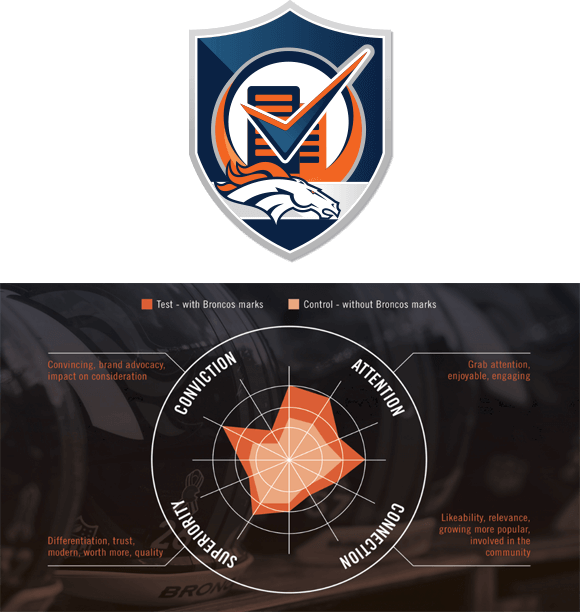 Leveraging the talent and technology of Top Rated Local®, the Broncos Business Pick is a way for you to protect, manage, build, and share your brand’s online reputation with ease. It starts with the Rating Score™ and the total reviews you have collected online from verified platforms, such as Google, Facebook, and Yelp. The Rating Score™ also uses the 5 Pillars of Customer Experience that empower both businesses and consumers: quality, value, timeliness, experience, and satisfaction. This allows consumers to quickly and confidently find and work with you — a Broncos Business Pick business in your neighborhood. 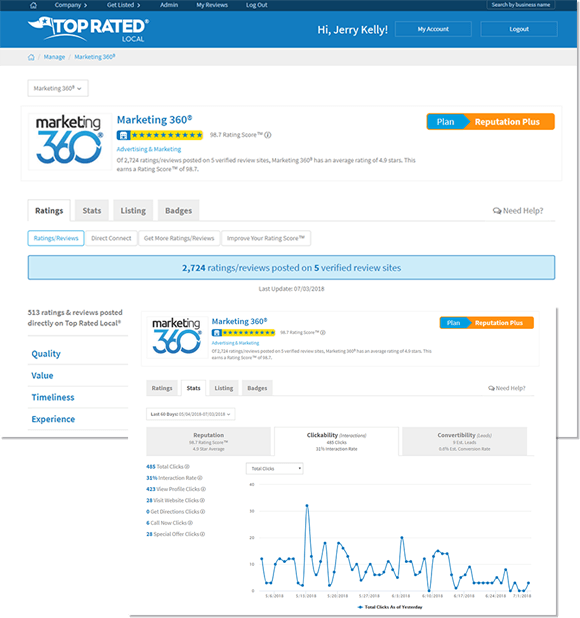 This aggregates a star-rating score that shows up in the search results pages so searchers can quickly see that you are supported by the community. Additionally, the badge enables you to write paid and organic ad copy with Broncos Business Pick branding and language, which increases the click-through-rate. Ultimately, the system was built to solve the everyday problems that face local businesses online: fake reviews, competitor reviews, slanderous comments, blackmail, and acts of interference of business from the competition. There needs to be a system in place where true customer experiences can be captured at the time of service, a system that allows for true customer identification and what that experience was like for that customer and business. 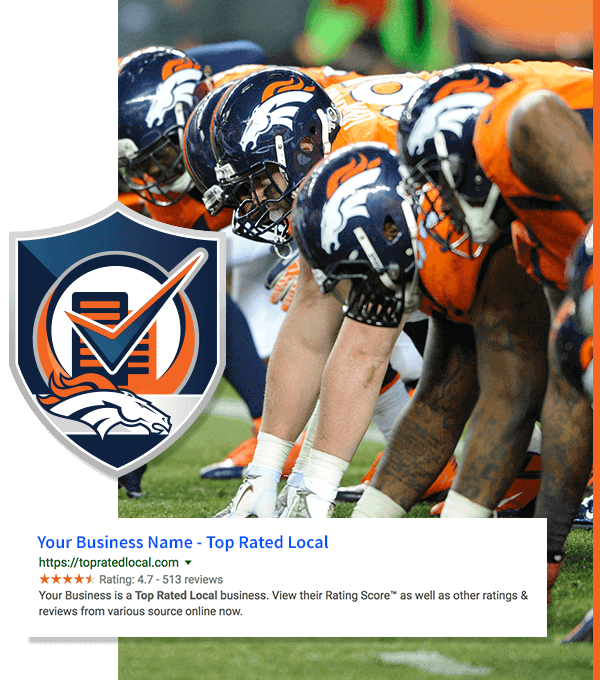 Thus, Top Rated Local® created the Rating Score™ and Broncos Business Pick to highlight what was important to you outside of just writing some comments (reviews). It is true, simple feedback that has more value and creates a place where the customer experience is amplified. This creates a more meaningful environment for customers and business alike. Did you know that 68% of adults in Denver are Broncos fans? 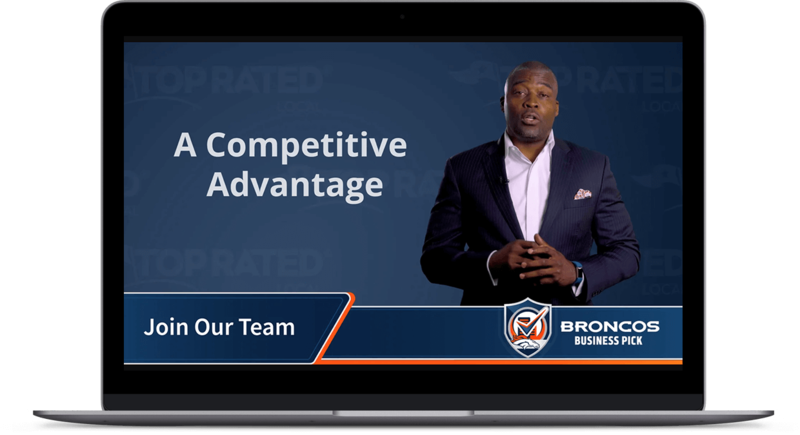 As a qualified small business owner with a sufficient rating status, you can better reach this fan base and more with a Broncos Business Pick badge that you can use across your website. It immediately attracts your customers’ eyes and establishes you as a credible and trustworthy business. The badge also acts as a link to your Top Rated Local® profile where customers can see your Rating Score™ and verified reviews. This helps site visitors see that your business is legitimate, reputable, and cares about them — your customers. Normally, small business owners could not achieve something like this branding partnership. This opportunity through Top Rated Local® and Broncos Business Pick instantly adds recognition that can, in turn, help you generate more leads and earn more business. Boasting the badge on your site means you have the ability to show your status and utilize the team logo and mascot to showcase your reviews and reputation. Another part of establishing yourself as a reputable local business is active engagement on social media. The Broncos Business Pick is extremely shareable and exciting for your community. Partners of the Denver Broncos reach 80-88% of Rockies, Nuggets, Avalanche and Rapids fans, while partners of those teams reach only 7-55% of Broncos fans. 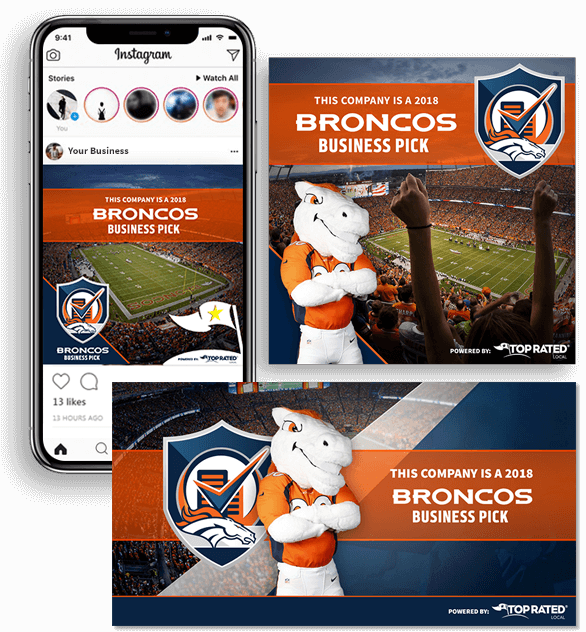 As part of our social strategy, you will be given access to a pre-approved design library of Broncos Business Pick assets. This library of assets is approved to be placed organically on your social pages. We design, build, and deploy these assets on your behalf. The library will have different creative images that rotate out for you to leverage unique posts all season long. These designs are special to the participating Broncos Business Pick businesses, thus making this even more exclusive for your business. Interested in a winning paid ad campaign using approved Broncos Business Pick Ad Templates? You can sign up with a dedicated Marketing Executive to implement approved ad templates in advertising campaigns. Target when, where, and who sees your remarketing banners with Retargeting Ads®. Show one set of banners to somebody that looked at one service and another set to somebody that looked at a different service. It’s easy and effective. Watch the performance of your campaign improve over time. Your ROI increases over time as your remarketing campaigns grow and become more optimized. 97% of traffic does not become a sale during the first visit to your website, but remarketing keeps your brand in front of those initial visitors. Retargeting Ads® get future customers to convert later when they’re ready. Once your Broncos Business Pick and Top Rated Local® page is set up, you can enhance the user experience by implementing a chat widget that allows for quick, user-friendly responses to further boost your credibility. These pre-generated responses can help direct the user so they interact with your TRL profile. Coming soon to the live chat is an accompanying video of Ring-of-Famer Rod Smith. 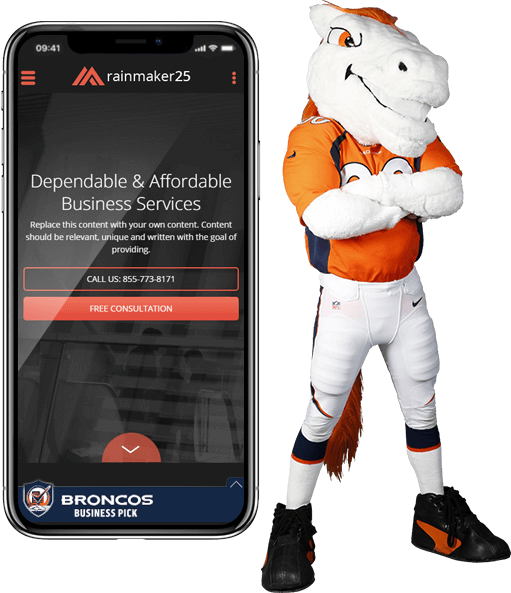 This is a great way to push your profile even further, by having Rod Smith state that your business is a Broncos Business Pick directly in the chat. It is said that your website is your 24/7 sales team, and a chat widget is capable of improving conversions by 30% on your site. A live chat widget provides your customers with a human touch that enables them a quick way to get help and solve their problems. The majority of online consumers would prefer a live chat option over email or a phone call because it is most effective and convenient. The number of users adopting a live chat feature are up 3% from last year, from 54% to 57%. A strong inbound lead generation strategy is designed to deliver leads to your local business as consumers are researching the best local companies to work with. 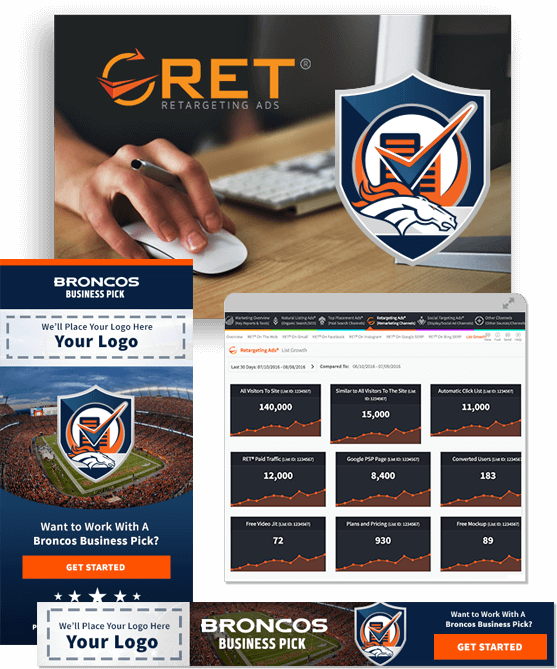 The Broncos Business Pick allows you to use the team branding and badges in ad copy and on landing pages. These ads target a broad set of keywords, audiences, and content that is focused on the local eco-system of search. All leads that are delivered are passed to you via traffic to your website, phone calls, and/or by getting directions. We do not sell leads to multiple vendors, ensuring that the lead that has reached out to you can be worked more efficiently. 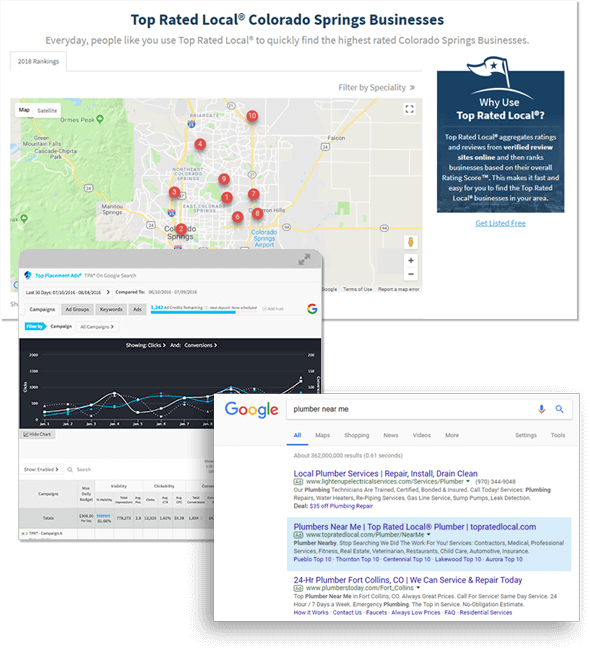 Building highly targeted landing pages and a powerful award system helps ensure that your brand and placement as a Broncos Business Pick is the first choice for consumer search of near me businesses in the Colorado market. All traffic to the site and your profile page will include mobile, desktop, and tablet search where it applies. With the mobile-first search era underway, it’s essential to stay relevant on all devices. Top Rated Local® is also an app that plays an important role in delivering a quality experience to the consumer so that they can trust and find the best businesses. Tracking all the customer-created content and getting a sense of your overall reputation online is becoming increasingly challenging. In some cases, there are dozens of review platforms a business needs to monitor, including Facebook and other social media channels. Getting happy customers to review you online and then tracking that content on a daily basis is important – but time-consuming. You can get one person at your business to be responsible for your reputation management efforts, do it yourself, or have your marketing company do it for you as part of the Broncos Business Pick. Do you send customers invoices or receipts? Do customers visit a website confirmation page after they purchase products or services? Do you drive around with your business information on your vehicle? Is there anything else you send customers consistently on an automated basis via a CRM or other method? If you answered yes, then these are great opportunities to ask for ratings/reviews and to leverage Broncos Business Pick designs! You can simply edit templates to include a section that kindly asks your customers for feedback. By doing this, you will find that you’d start to generate ratings/reviews and feedback to help improve your business and overall Reputation/Rating Score™ consistently and effortlessly in an automated and scalable way. 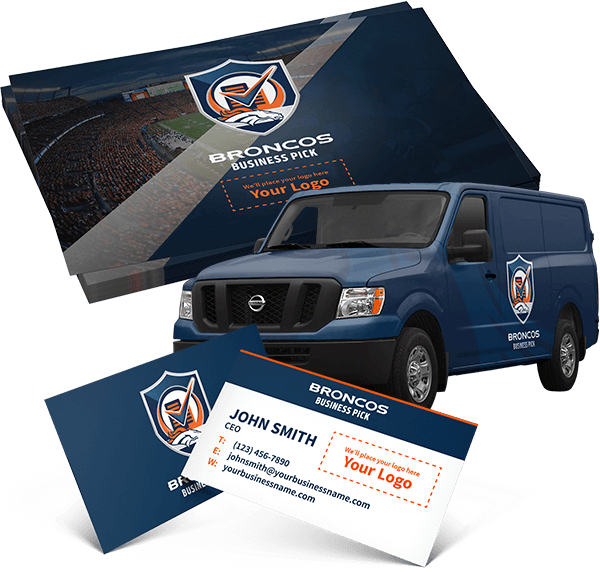 In addition to asking for reviews, you can leverage the Broncos Business Pick designs for printed material, magnets, business cards and more that you can pass out to your customers or display on your business. You can even leverage the brand in your emails or custom email signatures. The most notable difference between using the Broncos Business Pick branding or not is the immediate attention your business grabs. Additionally, these logos and marks help increase all amplified metrics: attention, connection, superiority, and conviction, culminating the effectiveness of these marketing efforts by 50%. The Broncos Business Pick sets you apart from your competition. Not only does this advocate for your brand, but it also shows your connection to the community. The Broncos Business Pick is engaging, trustworthy, and relevant. Use the graph to the right to compare the impact of the effectiveness of using the Broncos Business Pick branding to those who do not. As you can see, it positively impacts all facets of a strong reputation online. 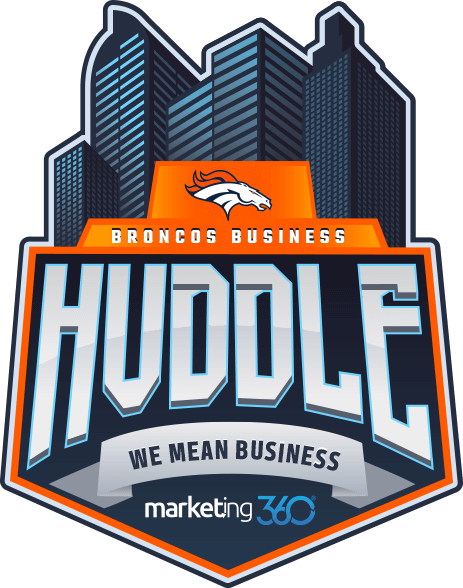 Join 200 other business leaders from around the state for the Broncos Business Huddle, hosted in the United Club at Broncos Stadium at Mile High. Throughout the event, attendees will receive valuable business and leadership insights from Broncos-designated specialists. Attendees will leave the Huddle with the educational know-how that can be applied to their business models. In addition, you can win exciting prizes, meet Broncos celebrities, and more! Everyday, we analyze ratings & reviews from hundreds of verified review sites online and then rank businesses based on their overall Rating Score™. This allows you to quickly and confidently find the truly Top Rated Local® businesses in your area.